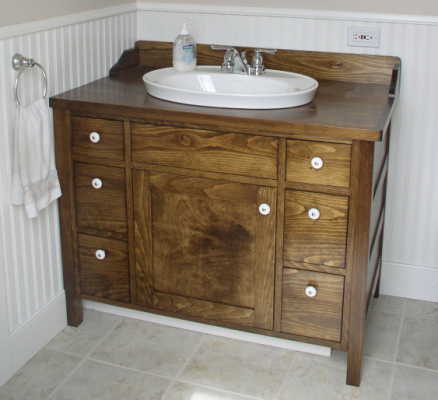 Build your own Washstand Vanity with these original design woodworking plans. Stonehaven Washstand Vanity - Woodworking Plans! This 40” x 24” pine vanity has the look and charm of an old-fashioned washstand that would have had held a ceramic water pitcher and a washbowl for cleaning up in the pre-plumbing days. It features a narrow pine face frame with inset slab drawers and flat panel door. The exposed “ladder end” adds the finishing touch to the authentic furniture look. The cabinet interior and drawers are a natural finish birch plywood. The 32" height is suited to either a low vessel-style or drop in style sink. — all in a 26-page printable PDF file that you won't find anywhere else. Reverse it - simply reverse the construction of the legs and top if the right end needs to meet a wall. Freestand it - for a freestanding vanity, build a mirror image of the ladder end and extend the top to match. Downsize it - scale it down to fit a smaller space by using a full vessel sink.